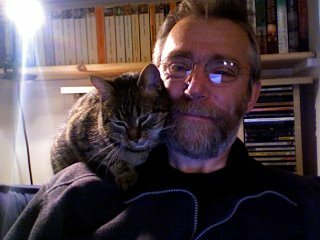 I've sent a great deal of time trawling through Masseria et al's paper on linoleic acid fed mice. I'm going to try to generate some data which aren't reported and see how much of a transgenerational effect really occurs. The most important variable I'd like to see, which was measured once a week throughout the study, was total body weight. I cannot find ANY body weights for 22 week old mice. All mice were weighed weekly, according to the methods. 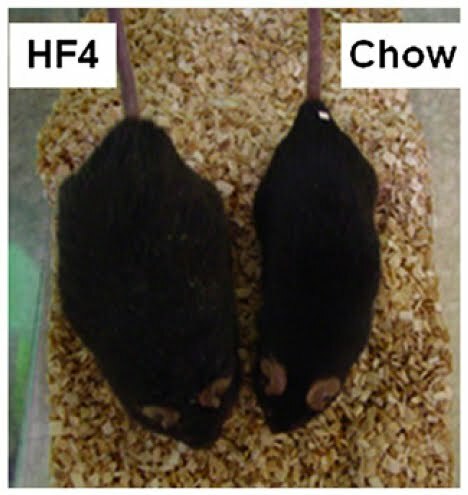 We can tell from the photograph of a chow fed mouse along side an HF4 mouse that the HF4 mice weigh more than chow fed mice. Fascinating. This image of these two mice is the total information on weights at 22 weeks of age. Why are no weights reported? Now, if you had a linear increase in body weights from generations HF1 through HF4, would you report it? Draw a graph perhaps? Bear in mind that you can generate this data with a set of electronic kitchen scales from Argos, no PCR or Western Blot required. Here are my fabricated data: At 22 weeks of age mice of generations HF1 through to HF4 weighed the same. There is not even an non significant trend to increase. Otherwise it would have beeen reported. Next, fat pad weights: All mice which made it to 22 weeks of age were euthanased. Now, to weigh their fat pads would need a visit to the local head shop for some slightly dodgy digital scales, but it's still not exactly rocket science. Masseria et al appear to have the scales anyway, because they weighed and reported the weight of plenty of fat pads in selected mice. But, in a research project on adiposity, they appear to have thrown almost all of the fat pads from 22 weeks of age mice in to the clinical waste bin. Of course, as per the body weights, they might have the data. If they do they are not saying. Is there a linear increase in fat mass from HF1 to HF4? I think it is reasonable to assume not. The "STD" chow fed mice are exposed to a "normal" mouse diet throughout. They stay insulin sensitive and have normal weight. HF0 mice are unique in the HF generations. In this first omega 6 fed generation there is a total of 19 weeks of exposure to the omega 6 diet, starting from weaning at 3 weeks of age and going through to 22 weeks of age. These mice do become over weight at 22 weeks, as judged by their fat pad weights as given in Fig 1, but not by as much as do the HF2 mice in the same Fig 1. They do not develop insulin resistance. Then there is a third set of mice, the HF1-HF4 mice, which are all exposed to the same diet for the same duration, ie throughout their gestation (assume 3 weeks for this), breast feeding (assume another three weeks) and weaning until 22 weeks of age, ie for 25 weeks in total. They develop an interesting pattern of insulin resistance. So to clarify: It looks very much as if we have three groups of mice. Chow mice never get exposed to high omega 6 intake, HF0 mice are exposed for 19 weeks and HF1-4 mice are exposed for 25 weeks. The number of weeks of exposure is what increases the bodyweight and this (exposure time) is what increases from generations Chow through HF0 to HF1-4. Within generations HF1-4* neither weights nor fat pad weights are reported. *Except of course the isolated value from Fig 1 part C where we just get HF2 pad weight, but we still can't see the "lack of trend" within these generations. I might have been tempted to just leave it at that and suggest that eating a high omega 6 fat diet increases you weight in proportion to the percentage of your life you were exposed to it, if it wasn't for Fig 4. Which makes it clear that the hormonal milieux is completely different between generations HF1, HF3 and HF4, the right hand three columns. Insulin is up at 4.5 times control in HF1, drops to 3 times control in HF3 and is down at 2.5 times control in generation HF4. HF2 can be interpolated between HF1 and HF3, I'll fabricate (fabrication warning!) a value of around 3.75 times control. So the very simple concept that a high PUFA diet, due to a failure to generate superoxide in mitochondria, increases adipocyte insulin senitivity, so facilitates weight gain at a given level of insulin, is not as clear cut as I would like. Damn. The main hint about what is happening comes from Fig 5. Because of the small group sizes I find it very difficult to accept that these lines mean very much in absolute terms. But there is, certainly, the impression that adipocyte numbers, especially numbers of small adipocytes, really does go up transgenerationally through generations HF1-4. Probably. So HF0 mice hit weaning with a "chow fed mouse adipocyte count" and get the next 19 weeks on a diet which maintains insulin sensitivity due to the limited production of FADH2 per unit NADH by its dietary fat. These mice get fat but stay insulin sensitive because 19 weeks on an omega 6 diet does not have time to produce enough adipocyte distension to generate enough insulin resistance to over ride the effects of the PUFA diet. Quite fat, but insulin sensitive. Utterly straight forward. Generations HF1-4 get 25 weeks of omega 6 exposure and all become more obese than HF0. But through the same set of generations they also develop progressively more adipose tissue hyperplasia. ie they have more and more fat cells. As the total number of fat cells goes up, so does the ease at which they accept fat without becoming so distended as to become insulin resistant. So HF1 have just a little adipose hyperpalsia and each adipocyte manages to hit distension induced insulin resistance by 22 weeks of age. By the time we get to HF4 there are far more small adipocytes available to accept fat, they do so easily and we end up, after 4 generations, with obese but far less insulin resistant mice. It looks like a simple trade off between the obesogenic effect of omega 6 fats vs the distension induced insulin resistance of the whole population of adipocytes. Omega 6 fats appear to be great for putting fat in to adipocytes. Adipose hyperplasia appears to be the key to maintaining insulin sensitivity during weight gain. Omega 6 fats are great for generating adipose hyperplasia. Having adipose hyperplasia means lots of half empty adipocytes are willing to signal that they are not full. Did you notice the leptin levels in Fig 4? Very interesting. Losing weight is not going to be easy if you are a human in this situation. There are hints from birth weights and pre weaning growth rates that this may be a process which starts in utero. There are also hints from previous publications by this group that the obesogenic effect of omega 6s can be blocked by indomethacin, a cyclo oxygenase inhibitor. That is; there is at least one, possibly several, layers of control in place over the F:N driven process. At a basic level the F:N ratio concept it is quite clear where the obesogenic effect might come from. That there are additional refinements to this concept is not surprising but, to me, tinkering with the control system when the basic engine of metabolism is broken, is worse than pointless. Try not to base your diet on corn oil. "These observations indicate that, despite the fact that glycemia in HF4 mice appeared normal at 22 weeks old (151 ± 30 mg/dl for HF4 versus 170 ± 30 mg/dl for STD mice), continuous exposure to the omega 6HFD led to a sustained increase in plasma insulin levels, which strongly suggests the emergence of insulin resistance of adult animals at later generations." Hmmmmmmmmm. Do we heed the voice of Author-ity or read the graph? Well, Hyperlipid is on going within the limits of the time I have. At the moment I am busy fabricating the data which were recorded but not reported in this fat mouse paper. Plus there were some interesting comments over on Sidereal's blog about why some people start off feeling great on ketogenic diets, then it all goes pear shaped. I've pulled out a couple of rat studies that might shed some light on this, for some people anyway. And I still want to look at iron and PUFA in the liver. Or at least in yeasts cells (!!!! might not be quite the same but...). And http://www.sciencedirect.com/science/article/pii/S1550413112004160 needs some serious thought (thanks Purposelessness, espec for the full text). All of these need looking at from the Protons thread point of view. Nick Lane has a new paper out on the origins of the electron transport chain precursor as life made the move away from the freebie energy gradients of the White Non Smokers to the wide ocean. And then there is the triggering of apoptosis by blocking fat uptake in to mitochondria.